Philips launches 8804 4K TV range with B&W sound system | What Hi-Fi? Philips launched 903, its first 4K OLED TV range with Bowers & Wilkins audio in 2018, and it now boasts a B&W-equipped 4K LCD TV line. The 8804 Series, available in 65in (65PUS8804), 55in (55PUS8804) and 50in (50PUS8804) screen sizes features a 50W, 2.1 channel set-up designed by the British speaker manufacturer. The system's two front-firing drivers are hidden beneath a cloth speaker grille designed by Kvadrat, the Danish textiles company. 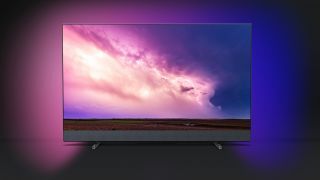 The LCD TV range gets Philips' trademark three-sided Ambilight, three HDMI inputs, Philips' P5 Perfect Picture Processing and Micro Dimming Pro technology. There's also a super narrow two-tone bezel that runs around the edge of the screen. All models are powered by the Android TV Pie operating system, boast Google Assistant built-in and support 'Works with Alexa'. This new range ticks virtually all the HDR boxes too, with Dolby Vision (and Dolby Atmos), HDR 10+ and HLG support all included. Philips claims the 8804 series uses the same B&W speaker system found in its five-star 55OLED903, so we're expecting big things when the range goes on sale during the first half of 2019. Pricing is still to be confirmed.